Dorothy Gutierrez of Santa Clara Pueblo has been in the trade of making nativity sets for a long time. She is noted for combining buff and polish. Most of her figures show tunics of unpolished light brown buff, whereas veils and mantels are richly contrasted with polished dark brown slip. The wise men bear corn ear, jar and wedding vase, and the little horses seem to be part of the unicorn family. The Infant Jesus is placed on a cradleboard, probably a reminder of Dorothy's Navajo descent. It is not a cradle that invites lullabies. It is typical of people frequently on the move and the practical need to carry babies as comfortably as possible. And so the cradleboard becomes the pilgrim's first resting place. 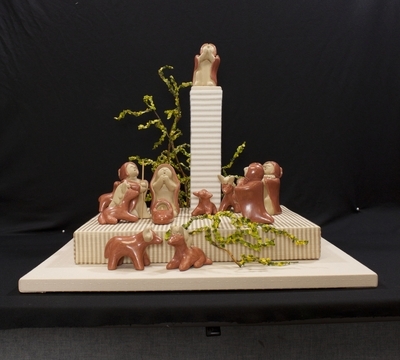 Burnished clay figurines depicting the nativity of Jesus, created by Dorothy Gutierrez in 1999 in the United States. Exhibition label originally written by Fr. Johann G. Roten, S.M. for exhibit entitled "At The Manger" and held at Roesch Library, University of Dayton.